The Gilmour Fund, our annual giving program, provides financial support to the many areas of ongoing expenditures in all aspects of the school. Tuition provides approximately 70 percent of the cost to educate each student from kindergarten through grade 12. The Gilmour Fund helps to offset the difference. We are fortunate that thousands of people, including Gilmour trustees, alumni, parents, past parents, grandparents and friends of Gilmour, contribute annually to the school, and every gift — no matter what size — makes a difference. What is The Gilmour Fund? The Gilmour Fund provides financial support to the many areas of ongoing expenditures in all aspects of the school. Tuition provides for approximately 70% of the cost to educate each student. The Gilmour Fund helps offset this deficit. Every gift to The Gilmour Fund - no matter what size - helps make a difference. 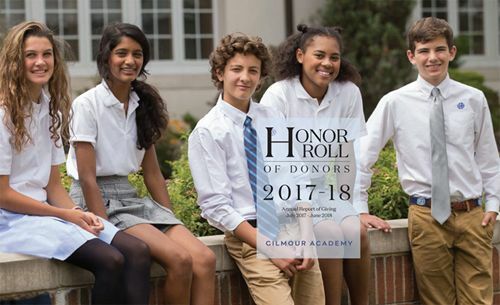 We are fortunate that thousands of people, including Gilmour trustees, alumni, parents, past parents, grandparents, and friends of Gilmour, contribute annually to the school. Why should I give to The Gilmour Fund? Over the years, Gilmour has been blessed with generous benefactors who have provided unrestricted funds to be used by the school to help us to grow and prosper. Many alumni were fortunate to receive financial assistance while they were students at Gilmour. Now many of these same graduates are in a financial position to help return the favor to allow current and future boys and girls receive the independent Catholic school education that Gilmour Academy can offer. You can make a gift to The Gilmour Fund in many ways. "Gilmour Academy provided me with the best private school, college-prepatory education I could have had. What I learned and experienced while at Gilmour is beyond compare. Therefore, I MUST give back to the institution that gave so much to me. That is why I donate. Simple – so others may share in the greatness that is Gilmour."